A galvanizing intergalactic experience, Urban Square’s ALIEN BREW PUB succeeds at being a “low key tavern” with its snickering moniker parodying New Mexico’s secret underground alien base. There’s a diamond-shined flying saucer (shown above) crashing above the resin-topped U-shape bar and a beer-drinkin’ green alien on the left wall welcoming those daring enough to step inside this cosmic Albuquerque-based clubhouse. Inside a well-kept freestanding corner building with a flat brown stone base and rust aluminum awning, Alien’s extraterrestrial interior features a skylight Cathedral ceiling, ample seating, rear brew tanks, stucco-walled tap handles and 3 TV’s. A cement-floored side deck with black metal furnishings offers outdoor splendor. Veteran brewer Rich Weber’s relaxing craft brews get complemented by delectable pub fare such, though the daringly heated bacon-wrapped jalapenos with cheddar cheese should be gobbled separately ’cause its a tempestuously terrific tongue burner. Open December 2015 (in conjunction with Weber’s long-time Moriarty-based Rio Grande and Sierra Blanca breweries), I initially visited Alien for a Sunday April ’16 noon swoon. Attentive bartender, Rachel, made damn sure my friend Dennis and I tried all 15 diverse house brews while mellowing out at a few centralized bar seats. Perhaps Alien’s most approachable brew, Crop Circle Wheat contrasted sharp curacao orange bittering against coriander-spiced navel orange tang above the light white wheat base. Crisply clean Rio Grande Pilsner brought mild Noble hop bittering to German pilsner malt sugaring as well as brisk celery, fennel and radish vegetalia. Refreshingly smooth Galaxy Lager (a.k.a. Outlaw Lager) coalesced caramelized pale malts with light citric hop dryness. Sun Chaser Pale Ale (a Sierra Blanca spinoff) delegated caramelized Munich malts to sweeten zesty grapefruit and orange sunniness atop oats-dried cereal grains. A few other Sierra Blanca-related brews included Alien Amber (the most popular beverage), a barley-roasted moderation with lemony orange fruiting, and the second best seller, Bone Chiller Nut Brown, an English ale yeast-infested medium body with polite grain-roasted coffee and dark chocolate tones. Two simple, likable India Pale Ales were next. Voluptuous Rio Grande IPA brought bright grapefruit, orange, pineapple and peach tropicalia to syrupy honeyed malts and relegated herbal hop notions. Dryer Area 51 IPA polished its yellow grapefruit tang with soft piney hop lacquer and currant-glazed peach and apricot illusions. Cascadian Dark Ale, Black Hole IPA, allowed cocoa-powdered dark chocolate bittering to consume copious dried fruiting over its piney hop char. Pleasant Cranberry Sour may have seemed out-of-step here as the lone sour ale, but its tart lemon-limed cranberry pucker, musky crabapple subtlety and lactic acidulated malting sufficed. Mild pilsner-infused Poncho Verde Green Chili greeted the tongue with roasted chili peppering atop olive bread crust. Sweet raisin and fig fronted molasses-sugared Alien Dubbel Belgian while banana bubblegum inundated rum-spiced, white-peppered Alien Triple Belgian. For dessert, two divergent dark ales hit the spot. First up, stylishly easygoing Imperial Stout leaned on light-roasted coffee overtones to upend nutty chocolate sweetness. Meanwhile, creamy Milky Way Stout recalled the iconic candy bar by serenading its caramelized chocolate nougat center with vanilla, toffee and dark cherry nuances. A charming alien-themed pub, this cosmic joint generates a varied crowd of sports fans, businessmen, lighter beer aspirants and lucky New Mexico vacationers. 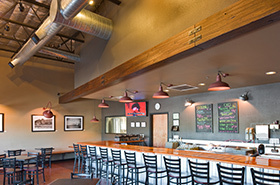 Just off Route 25 in a beige-pinked stucco mini-mall, ever-expanding BOSQUE BREWING on San Mateo Boulevard was going through remodeling to double its size while completing a major menu overhaul during my initial April ’16 two-hour stopover. Makers of award-winning Scale Tipper IPA (now bottled), Bosque also has a Girard Boulevard Public House and Las Cruces Taproom nearby. Named for the cottonwood forest bordering the Rio Grande, Bosque sprung to prominence October 2012. Its wooden bar top has the brewery’s insignia etched in. For future expansion, the 20-seat taproom (with eight tables) will be expanded on the right side with 50 more seats available. Brew tanks are located in a separate left room space. Though Bosque was out of its flagship Scale Tipper IPA, there were 12 more vibrant choices available for perusing as Villanova beat North Carolina University for the NCAA Basketball championship. Out of the six brews examined this Monday eve, only sweet-tart Fruited Wheat, with its cranberry-soured raspberry rasp and sugared wheat spine, was in limited edition. The rest were virtual mainstays, though as of springtime ’16, Bosque had already crafted 90-plus different beers – many in small batches. Impressive Bosque Lager retained a brisk off-dry flow with its light milled grain minerality, sugary pilsner malting, and lemony snicker hovering softly above the baked bread spine. Approachable moderate-body, Brewer’s Boot Amber Ale, brought sweet ‘n sour citrus tartness, light-roasted barley-oats and subtle earth tones to sweet honeyed biscuit malting. Mild peated Scotch malts anchored Scotia Scotch Ale, a honey-sugared wee heavy with red-fruited sweetness picking up dewy moisture. Exquisite Riverwalker IPA shined brightly as grapefruit-dried piney hop bittering contrasted perfumed tropical fruit sweetness. A tangy array of pineapple, mango, peach, navel orange, tangerine and passionfruit illusions add sunshine to the yellow grapefruit entry. Before leaving, mocha-bound dry body, Driftwood Oatmeal Stout, brought oatmeal molasses sweetness to black chocolate, nutty coffee and black cherry illusions. Almost directly across Chama River Brewing off Pan American Freeway, Albuquerque’s awesome NEXUS BREWERY & RESTAURANT champions the flavorful ethnic diversity of this Southwestern Rio Grande Riverbed mecca. Since the Craft Beer Revolution gained national prominence, most of its brewmeisters and entrepreneurial investors have been white males. However, dark-skinned Nexus owner, Ken Carson (a former banker), and female head brewer, Kaylynn McKnight, prove there’s cresting talent beyond the litany of pale-faced zymorgists. In a tan stucco building next to Best Western, Nexus provides a delightful pub food change-up by offering hearty New Mexican-styled Southern soul food (such as chicken-fried chicken, red chili-peppered collared greens and gumbo) to go alongside impeccable house brews on my April ’16 two-hour lunchtime jaunt. Since its initial 2011 opening, Nexus has expanded beyond its pristine cocktail-lounged 8-seat grey bar (with glass-encased copper brew tanks, silver spaceship lighting and multiple TV’s) to a remodeled cement-floored side dining room with beer-centric murals and small outdoor deck. As my friend, Dennis, and I grab a dining table, we dig into New Mexico Soul Burgers (with red chili-sauced bacon, onion and pepper jack cheese) while quaffing eight beer samplers. Starting with dry-hopped American Red Ale - a nifty moderate-bodied offering with spiced red and orange fruiting glazing toasted caramel malts over tobacco-roasted barley crisping – the quality and care given each well-balanced stylistic elixir was immediately evidenced. Rounded flagship, Scottish Ale, had a similar malt-spiced profile as the Red Ale, adding nutty pecan, almond and hazelnut illusions to caramelized molasses sweetness and mild peat-smoked hop astringency. Amiable Honey Chamomile Wheat brought chamomile tea florality to coriander-salted orange and tangerine tang as well as Bee’s honey sinew. The heightened 9.3% ABV given Imperial Cream Ale (compared to the original version’s pre-prohibition-styled 4% volume) provides sweet white-wined nuances to crystal-malted cream soda sugaring and grassy-hopped astringency. Mellifluous Imperial Pilsner placed crystal-malted mango, guava, nectarine, peach and lychee sweetness and tart pineapple-grapefruit-orange bittering alongside light woody hop dryness (and wispy vodka kick). Briskly clean-watered IPA layered tangy grapefruit, orange and lemon zest atop sticky pine-needled hop resin, juniper berry bittering and herbal tea nips. Dry English-styled Chocolate Porter slid chocolate-roasted molasses sweetness across dark-roasted coffee, anise and nut illusions. Best bet: supple English Barleywine, a boozy 9% ABV dessert treat, plied sweet dried fruiting to caramelized Maris Otter malts, floral perfumed hops and rum-spiced sugaring, picking up tangy bruised orange, tangerine, red cherry, red grape and honeydew notions. One of New Mexico’s first and best microbreweries (active since 2005), located in an exquisite siena-hued terracotta barnhouse off Pan American Freeway, Albuquerque’s silver-roofed CHAMA RIVER BREWING COMPANY serves upscale pub fare (steak, seafood, pasta) to pair with its well-designed traditional brews. Easy to spot from the freeway due to its large sidled grain silo, Chama River Brewing’s interior wood design, foyer-bound water feature (with resin pheasant), stone hearth and tiled front patio provide crystalline elegance. Its copper-clad center bar (with 10 tap handles, several stools and TV) services a private lounge and booth-laden Porter Room. Sterling glass-encased brewtanks store most of the nine proprietary offerings tried during my April 2016 sojourn. For starters, rounded Class VI Golden Lager regaled German pilsner malts with raw-honeyed sour lemon musk, maize-dried graining and grassy hops. Then a few moderate-bodied ales sufficed. Rio Chama Amber brought light honey spice to tangy navel orange briskness and toasted carafa malting. Mild India Pale Ale-like citric fruiting guided Copper John Pale Ale, a floral-perfumed dry libation with zesty grapefruit-pineapple-orange juicing embittered by piney hop resin to contrast sweet sugar-spiced crystal malts. IPA overtones also embrace soft-toned Vermilion Red Ale, a red and orange fruit-spiced nicety not far removed from Chama River’s most popular item, Jackalope IPA. Named after a mythical antlered rabbit, its tangy yellow grapefruit freshness and bitter lemon rind pucker overload the zesty tropical sureshot as pine-lacquered perfume hops contrast crystal-malted mango, pineapple, orange, tangerine and guava sweetness. Orange blossom-honeyed coriander tweaked Broken Spoke Honey Wheat, a mildly citrus-spiced moderation backed by torrified husked wheat minerality, grassy hop astringency and floral daubs. A fine collaboration with neighboring Nexus Brewery, nitro-injected The Darker Fare Irish Stout fortified its softly creamed black chocolate fudging with coffee-roasted espresso and charred nuttiness. Nearly as dry and arguably better, Sleeping Dog Oatmeal Stout coalesced sugary molasses oats with coffee-milked black chocolate, walnut, pecan and hazelnut illusions.